Students who want to join the process technology workforce recently received a $60,000 boost when Gulf Coast Growth Ventures donated the money for scholarships to Del Mar College. The scholarships will be awarded to students wanting to earn associate degrees in industrial instrumentation, industrial machining, occupational safety and health, environmental/petrochemical lab technology, or process technology — all skills sought after by local industries. 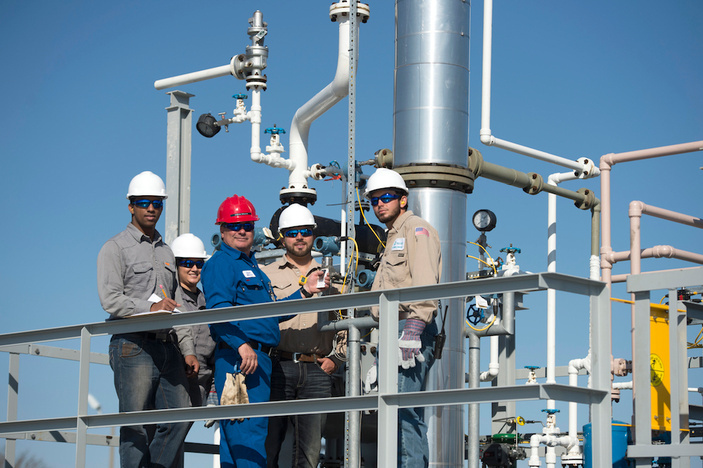 Gulf Coast Growth Ventures is a joint venture between ExxonMobil and Saudi Arabia Basic Industries Corp. to build a $1 billion ethene steam cracker plant near Gregory-Portland. With chemical sales of $37.6 billion, SABIC is the world's fourth-largest chemical producer by sales. While site work is underway at its 1,300-acre location on the south side of Texas 181 and west of FM 2986 near Gregory, the plant is awaiting air quality permits from the Texas Commission on Environmental Quality. The plant is expected to hire about 600 permanent employees when completed. The $60,000 will be handed out as full scholarships of $2,000 each to Del Mar students taking nine or more credit hours. Partial scholarships will be available to part-time students taking three to eight hours. Eligible students must maintain a minimum grade-point average of 2.5. Students from Gregory, Portland, Ingleside, and Taft will be given preference when scholarships are awarded. Scholarship recipients will not be guaranteed jobs at the plant but will have a competitive advantage, Guilfoyle said. “We look forward to continuing our partnership to align curriculum to ensure Del Mar students are prepared for the high-quality, good-paying careers we will have at our plant,” he said. Last August, Gulf Coast Growth Ventures donated $100,000 to the San Patricio County Workforce Development Consortium to support Del Mar’s high school programs. Last February, it awarded $54,000 in scholarships to 17 students majoring in process technology at the college. Tagle plans to graduate with a second degree in environmental/petrochemical lab technology next year. Romeo Loscana used the scholarship money to earn a process technology degree. Loscano has some advice for students interested in applying for one of the new scholarships.